Paul Rosales knows many people start building their own planes, get frustrated, and never finish. That’s why he started telling his story that it is possible to do it, and have a lot of fun as a result. Rosales is proof that sheer determination can do wonders. He works two jobs—second shift for Lockheed’s Skunk Works and days as a substitute teacher—to pay for his aviation habit. He and his wife, Victoria, spent more than 3,000 hours over five years building an RV-6A, and finished it just in time for EAA AirVenture Oshkosh 2000. That year the plane received top honors among kit-builts for outstanding workmanship. Rosales added to his awards this year when he received the Bax Seat Trophy Thursday evening at Theater in the Woods. The award is presented each year by Flying magazine to the EAA member who perpetuates the Gordon Baxter tradition of communicating the excitement of flight, along with providing valuable information that makes people better pilots and builders. 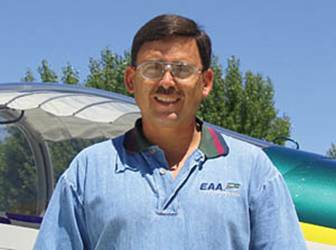 Rosales, an EAA member since 1994, has written feature articles for EAA Sport Aviation and his EAA Chapter’s website and newsletter. Rosales has put about 2,000 hours on the RV-6A, flying it to 49 states, Canada, the Bahamas, and the Turks and Caicos Islands. He started writing stories to give builders a reason to finish their planes. Bob Mackey, former EAA director of Chapter Relations, saw one of Rosales’ articles and recommended it for EAA Sport Aviation. It was published, and Rosales added magazine author to his list of occupations. A pilot for 25 years with 2,120 hours—all VFR—Rosales says he has few regrets. One is that he didn’t join EAA sooner. “I just didn’t know about it,” he says. He will certainly keep having fun by flying and writing about his exploits, convincing countless others that “aviating the EAA way” can enrich your life.